With more than ten years of experience, we are a global team of experts that specialize in architecture & interior design. Founded in 2016 by Anita Darash, our goal is to deliver exceptional equality design, supplies and installation on a wide variety of projects throughout Austin, Texas. We work with contractors, builders, designers, architects and dealers on both residential and commercial projects with experience in kitchen cabinetry, bathrooms, flooring and tiles. We focus on timeless designs that integrate eco-friendly materials and sustainable functionality and construction. Classic European designs, techniques and qualities are at the core of our design and installation process, transforming every-day living spaces and ensuring unparalleled customer satisfaction in every phase of the project. Anita is a design/supply, installation, hospitality furniture, and marketing professional, with over ten years servicing the Texas area. Focused on elegant, timeless designs with a commitment to quality and customer satisfaction. Additionally, these experiences have sharpened her ability to service/motivate clients and deliver creative solutions for a wide range of residential and commercial living spaces. She invests time annually attending European trade-shows, visiting production factories, and researching new materials to meet your diverse project requirements. 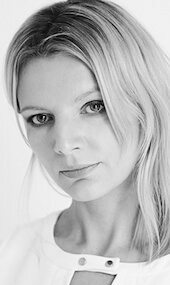 Magda is a European designer focused on contemporary, elegant interiors. Each new project is approached as a new, exciting adventure. Always at the forefront of functional modern design she researches solutions that are aesthetic and spatial. She enjoys creating interiors in harmony with people, for people. Magda brings to the table a keen eye for detail that works with each and every project design - a seamless blend of beauty and utility at its best. She is a graduate of studies in the field of industrial design. She has completed in numerous post college programs gaining knowledge supported and receiving many certifications related to design applications such as 3ds Max, Inventor, and AutoCad. She currently designs kitchen and bathrooms. Additionally, she manages and creates By Darash’s social networking content. Daria attends international fairs and follows the latest trends in interior design. This brings much needed European flare to the team, and we are very proud to have her. top quality interior design & architecture services. At By Darash, we're more than happy to schedule an appointment at your earliest convenience to further discuss your project. Contact us using the button below, or call us at 512.712.3530.